My preparations for the beach this weekend include a pedicure. Ang landi, I know, but my toes are ugly enough as they are. The least I could do is to make my toenails clean and presentable since I'll be in flip-flops most of the time. At least I won't have to bury my feet from embarrassment. I've always had trouble cutting my own nails. I could never do them right. It doesn't help that I unconsciously peel them off--sometimes to the point that they bleed. 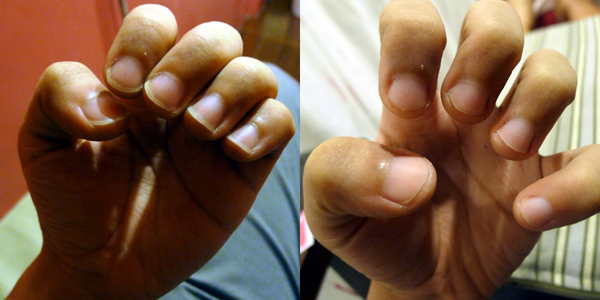 But at least I've graduated from biting my fingernails, which have resulted to deformity. This is why I let other people do my nails--especially on the toes. It's expensive if done regularly (P390-420 for a Mani-Pedi), which is why I get them done every other month or every 3 months. But really, I'm just on the lookout for a pedicure place that's near my house and easy on the budget. Any add-ons are bonuses. Their banners got me. P350 for a Manicure, Pedicure plus Foot Spa. Go na toh! Spa101 along Katipunan Ave. is above Pancit ng Taga Malabon and beside Bo's Coffee. The stairs leading to the second floor. Kinda creepy especially at night. This was the seat beside mine. I was led to the area behind the brown curtains to have my feet soaked in warm water for 10 minutes. You can't see it but my feet were resting on stones. While getting my foot scrubbed, the attendant found it weird that I was taking pictures. "Siguro magtatayo ka ng spa, no?!" Tag team. While Ate Sha scrubbed my foot, someone else was doing my fingernails. Before and After. Not impressed the first time around. I was kinda disappointed at how my manicure tuned out. There were so many jagged edges that could have been filed and dry skin left on my thumb that could have been removed. There was even a hangnail on my index finger that they forgot to remove. I felt that I could have done better. Good thing the attendants were easy to talk to so I requested for it to be improved. Maybe I'm too nice. Pedicure time! Kakaiba talaga ang sarap tuwing tinatanggalan ng in-grown. Since I was very pleased with how Ate Sha did my toenails, I let her fix my fingernails. I saw their waxing and massage area on the 3rd floor on the way to the washroom. They gave me a loyalty card even if the minimum spending to earn a stamp is P400. I only spent P350 for the Mani-Pedi. According to the staff, I'll get my first stamp the next time I visit... even if I spend below the minimum. According to the attendant, most guys who frequent the place avail of the foot spa or massages. Very Affordable. P350 for Foot Spa, Mani and Pedi! Long hours. Open from 11am-9pm. Last call is at 8pm. Efficient. Mani-pedi is done simultaneously by two attendants. Relatively fast. The whole process took 1hr and 15 mins. This included the foot spa already. They're careful. While slowly removing my in-growns, attendant kept asking if it was painful. Water used for soaking feet could be warmer. Wouldn't mind if soaking was longer, too. Better training for attendants. Just look at how they did my fingernails the first time! Payment via credit card? I almost didn't have enough cash awhile ago! Interiors could use a make-over. Although there was an attempt to make the place kikay, the place looked a bit old, dirty and shady. The place was dark and some of the seats were stained. Having Wi-Fi would be a big plus. I sat there for an hour with nobody to talk to. My phone sometimes connected to Bo's Coffee's Wi-Fi, but it wasn't strong enough. I was really just looking for an affordable place to get a pedicure but ended up getting a good deal for a Mani-Pedi, which included a foot spa. You basically get what you pay for here. No frills. Just the basics. Observe how they cut your nails and don't be shy to speak up if you're not happy with what they've done. I wouldn't mind going back. My feet are definitely ready for the beach! Today I start what I've always wanted to do: a travel blog. From tripledothenson, I've officially changed this to Boy Wander. Even if I'm not the best writer around, I want to share with people my wanderings: my stories, adventures and misadventures, extra honest opinions, and photos. If the world is going to end this year, I guess I better make the most out of it starting... now.